How Will A Bear Market Affect Your Plan? In this week’s edition of the Ballast Atheneum, I am going to explore a subject no one wants to see but we all must prepare for; Will my portfolio survive a bear market? Fortunately, we can use some of our technology tools, specifically, Monte Carlo analysis to determine how prepared a client is for a bear market. 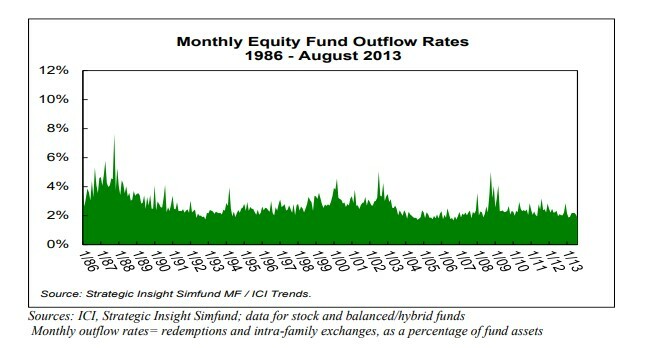 It is no wonder we witnessed a spike in mutual fund sales during this period. What proved to be the investment opportunity of a lifetime drove many investors to the sidelines. Sadly, many people let fear dictate their decision making and sold near market lows. Conversely, those who were able to stick to a long-term allocation plan and had confidence in that plan, would have recognized that period as a reality of being a long term investor. As investors, particularly those accumulating investment assets for a certain goal (i.e. retirement), we must understand that down market periods are inevitable. We have discussed in recent commentaries that we believe market sell-offs and increased volatility are part of healthy markets over the long term. However, we do not believe the best approach to dealing with this inevitability is to just sit on your hands. We have consistently encouraged our clients to be proactive in ANTICIPATION of bad markets, not in REACTION to them. Furthermore, we do not believe this action is one based in short-term thinking, it is critical to think of such positioning in the context of your long-term plan. We spend a great deal of time with our clients figuring out what allocation fits their long-term goals, knowing that they will experience markets, both good and bad. Is your portfolio positioned to deal with inevitable market pullbacks? The good news is we have tools to make more educated decisions when trying to answer this question. As stated above, each achieved the exact same average return over a relatively short term period of five years and the final results are drastically different. -Bill ends the five years period with over $314,000 less than Julie. Notice how his first two years were negative. -Even with only one poor year to start her plan, Mary ended her plan with over $100,000 less than Julie. -The most desirable result came from Julie with steady returns of 8% each year. Although Julie’s “sequence” is virtually unattainable, this example does quickly explain why a portfolio that achieves steady returns (misses big up years and avoids big down years) is most desirable for many investors. If we look at Bill, his portfolio could resemble someone who was an aggressive investor leading into the financial crisis. Bill experienced two poor years of market returns and even with three very positive years to follow, he still is far behind the other three portfolio examples. When we sit down with investors who are planning to take portfolio distributions, we prefer to run long-term Monte Carlo analysis to display what impact a poor sequence of returns might have. 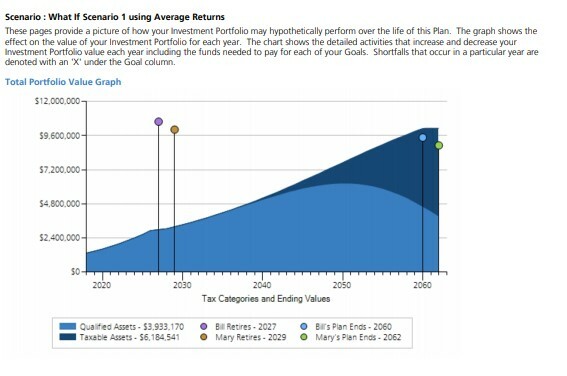 Below is an example of a plan showing portfolio income when someone achieves the same return each year. As I mention above, markets have rarely ever provided equal returns over a five year period but unfortunately this is how most people view their financial plan. 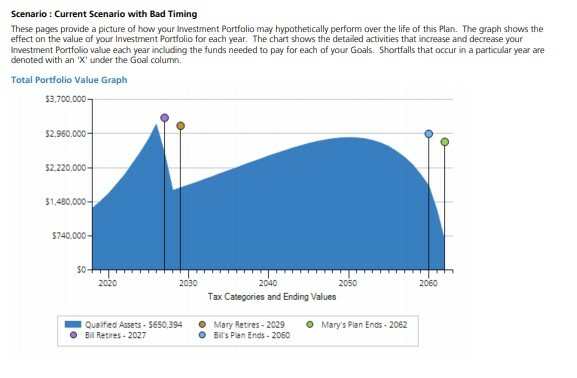 In this next example, a period similar to the Financial Crisis is applied in the early years of the plan. Notice the difference in long-term preservation of assets when the household experienced negative returns in the first couple years of retirement. You can see in the above graph that the portfolio survives both lifetimes but the ending values are VASTLY different. For the purposes of this example, I am using a portfolio that is 100% invested in stocks. In the next chart, when we shifted the allocation to one with other asset classes (including 25% in bonds) and displayed increasing 401k savings through retirement by 4%, we achieved a much more desirable result. The above chart is a great example of the eventual “compromise” we make with our client plans. A client may have expectations of retiring at a certain age on a certain budget and our final plan recommendations often include changes to the budget, allocation, retirement date, or savings up until retirement. In each scenario we see, slight changes to any of the factors can have an impact on our final Monte Carlo projections. 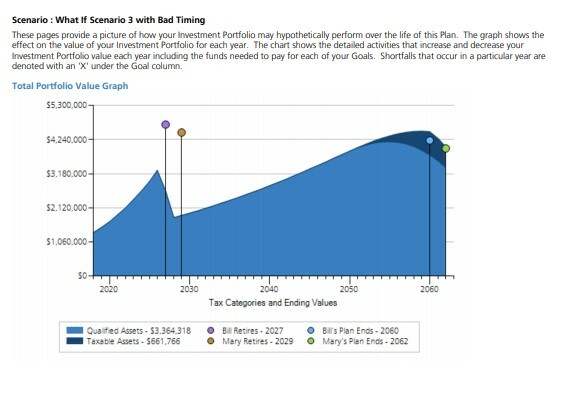 We can test your current and expected future portfolio to determine if your plan can withstand a poor sequence of returns. By shifting your allocation and increasing your savings up until retirement, we can increase your chances for success. We prefer to make portfolio allocation changes well in advance of retirement: at least several years in most cases.